CollegeIdiots Production. (13 June 2006). Cottage Cheese. About a guy who found something wrong "down there" and he went to call doctor by using VRS. Made at Gallaudet University. HOVRS commercial. Hurry up! Slow video interpreter. Cameo by ASL Comedian Keith Wann and www.mosdeux.com co-founder Wayne Betts. "I know you!" Bad Video Interpreter. Appearances by ASL Poet Storyteller Peter Cook and ASL Comedian Keith Wann. Filmed by Wayne Betts. Interpreter. 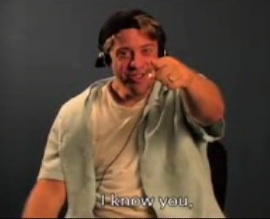 Video Relay Interpreter struggles... Cameo by ASL Comedian Keith Wann. Filmed by Wayne Betts. mindytheron. (2007, September 27). Cool VRS ASL. mocking vrs...mocking interpreters...laugh it off...all is bs..
PinkyJuggler. Pinky Tells the Real Story Videophone & Video Relay Services DVD DVD153. Here is a sample. Wann, K. (29 January 2006). Watching Two Worlds Collide - You smell like farts. A story about relay operators and the mischief involved.